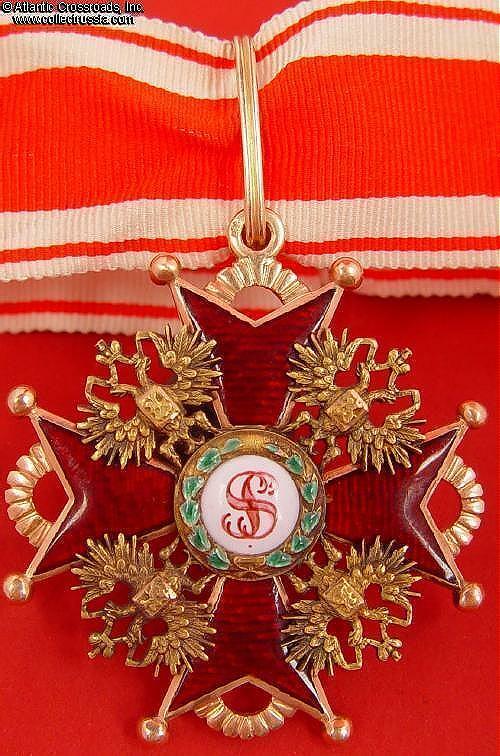 $9,800.00 Order of Saint Andrew the First Called, Civil Division, Breast Star by an Austrian maker, 1872-1902. Shows silver Austro- Hungarian silver export hallmarks. In excellent condition. $7,500.00 Order of St. Vladimir, Civil Division, 3rd cl. neck badge, in gold, by Eduard (VD), 1910-1916 issue. In excellent condition. Includes original suspension loop in hallmarked gold. $4,400.00 Order of St. Vladimir, 4th cl. for 25 Years of Service, breast badge in gold, by Albert Keibel, 1899-1903. This relatively early award for 25 years of service is even harder to find than the scarce issues for 35 years. In very fine condition. $850.00 Order of St. Vladimir Rosette for Neck Badge (2nd or 3rd class), to wear on the breast if a higher decoration is present. A very scarce unaltered piece in very good to excellent condition. $2,200.00 Order of St. Anne, Military Division (with swords), 3rd cl. breast badge in gold by Albert Keibel, 1904-1908. This uncommonly late piece by Keibel has assayer's hallmark "AP" and was most likely awarded for the Russo-Japanese War. In fine to very fine condition. $1,600.00 Order of St. Anne, Civil Division, 3rd cl. breast badge in hallmarked gold, by Albert Keibel, 1882-1899. This very elegant, extremely early AK piece includes connecting loop in gold and original ribbon. In superb condition - literally one of the best examples we have seen. $2,995.00 Order of St. Stanislaus, Military Division (with swords), 2nd cl neck badge with original gold loop; by Albert Keibel, 1899- 1903. The swords are added but appear to be of the period. In excellent condition. $1,390.00 Order of St. Stanislaus, Civil Division, 3rd cl. breast badge in gold, 40 mm, by Albert Keibel, 1882-1899. An elegant, relatively early Kapitul piece by Keibel. In excellent condition. Includes golden suspension loop. $190.00 Actual 9 January 1918 Conveyance Document for Russian Order Insignia authorizing bestowal on five French military Officers [four generals and one Commandant (Major)]: a St. Alexander Nevsky with Swords, a White Eagle with Swords, a St. Anne 1st Class with Swords, and a St. Vladimir 4th Class with Swords). $265.00 Two exceedingly unusual 1917 Provisional Government Award Documents for Order of St. Anne 2nd Class w/Swords to a French Army officer for bravery on the Western Front.